The Babolat Pure Drive Standard Cortex was named by the Tennis Magazine to be the racket of the decade in 2005. 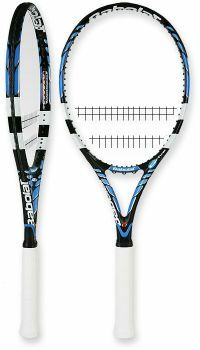 Overall the racket is light and provides good power and spin making it a good fit for a variety of playing styles for mid to high skilled players. The racket provides good feel, power, control and spin from the baseline. It also has quite a large sweet spot. You are able to take a good swing at the ball and still keep it inside of the lines. At the net the Pure Drive provides good maneuverability and in general performs well. But a little more weight in the head of the racket would have made it more stable at impact. The Pure Drive performs well on the serve. You can generate good power combined with spin and control. For the return of serve the racket provides good maneuverability. When you take a swing at the ball the racket is stable and provides good control. However, the racket needs a little more weight for added punch when blocking the ball back.